Vaclav Havel began his official career as a politician the day he was elected president of Czechoslovakia. And yet, he in no way lacked experience for the job, having led a moral and philosophical battle against the previous totalitarian regime for most of his life. A renowned playwright, writer, and intellectual, Havel's career began in the realm of art and ended in politics. Milan Kundera wrote, "Havel's is the rare life that resembles a work of art and gives the impression of a perfect compositional unity." His aesthetic endeavors, while moving and powerful, could not influence politics alone; his political undertakings changed the country, but developed based on his aesthetic philosophy; in the end, a combination of Havel's aesthetics and politics produced the most powerful influence for the future of Czechoslovakia. Havel was born October 5, 1936 to a bourgeois family - an initially privileged situation which would soon change for the worse and influence his whole life. Because of this background, Havel was not allowed to pursue a higher education after he completed his required schooling in 1951, so his first job was as a laboratory technician, after which he studied at a technical college. Meanwhile, he became interested in poetry and founded a literary circle called the Thirty-Sixers, after the year of his birth. Havel was deeply influenced by the works of Kafka, even though his novels were banned by the communist government, and he often visited the poet Jaroslav Seifert, who helped him with his first steps into the literary world. After two years of military service, Havel first entered the realm of theatre by becoming a stagehand, and then the resident writer for the Theatre on the Balustrade in Prague from 1960 to 1969. It was then that he joined Group 42 and started to get noticed as a writer. While working at the Theatre on the Balustrade, Havel was finally allowed to pursue his education at the Prague Academy of Art. His first play, The Garden Party, came out in 1963, and already established Havel as a political satirist. Often compared to George Orwell, Havel also played with the idea of "doublespeak," or the official bureaucratic language of the communist regime. Afterwards, he enrolled at the Academy of Dramatic Arts and graduated in 1967. In 1969, Havel's passport was confiscated by the authorities because his writing was considered subversive. His subsequent plays were indeed subversive, presenting the absurd situations of everyday life in a communist system, and often in part autobiographical, such as his series of one-act plays in which the protagonist is a nonconformist playwright in trouble with the establishment. In the mid-1970s, Havel wrote two incredibly influential and important essays that would lay the foundations for the new Czechoslovakia which he would lead a decade later. The first, written in April 1975, was an open letter to Dr. Gustav Husak, General Secretary of the Czechoslovak Communist Party. In it, Havel argues for "the moral and spiritual revival of society, for the enhancement of the truly human dimensions of life, for the elevation of man to a higher degree of dignity, for his truly free and authentic assertion in this world." He explains that people are constantly living and acting out of fear and apathy, which gives the illusion of a consolidated society. This problem is further propelled by the secret police, whose presence drives society through the fear that someone is always watching and listening, creating citizens willing to support anything as long as it gives them an advantage - where positions of power are taken only by opportunists and careerists, and the people have lost faith in the future. He finishes with a personal plea to Husak: "â¦your responsibility as a political leader is still a great one. You help to determine the climate in which we all have to live and can therefore directly influence the final size of the bill our society will be paying for today's process of consolidation." Havel would go on to remember this responsibility during his thirteen years as president of first Czechoslovakia, and then the Czech Republic. In 1976, influenced by the arrest of several musicians for political reasons, Havel helped shape the Charter of 77, which would be published on January 1st, 1977 and signed by 243 prominent Czech intellectuals, forming a "loose, informal and open association of peopleâ¦ united by the will to strive individually and collectively for respect for human and civil rights in our country and throughout the world." Naturally, the reaction of the government was quite harsh, and Havel would go on to spend time in jail from 1979-1983, after being sentenced to four and a half years for subversion of the republic. After his release, Havel continued to write plays, but was propelled more and more into politics by necessity. He became the leader of the human rights movement in Czechoslovakia, and he formed the Civic Forum in November 1989. After his leading role in the Velvet Revolution that December, he was elected by direct popular vote as president of Czechoslovakia. Vaclav Havel's presidency ended in 2003. Having witnessed the break-up of Czechoslovakia, his election as the first president of the Czech Republic, the joining of the Czech Republic to the European Union and NATO, Havel stands as the most important figure in Czech history in the second half of the 20th century. However, what makes Havel extraordinary is that he never lost his artistic spirit to the void of politics; rather, he remained modest and moral, strongly rooted in his philosophical beliefs and constantly working not only towards the good of his country, but the world as a whole. Vaclav Havel passed away on the 18th December 2011, at the age of 75. A week before his death, and wheelchair-bound, he met for a final time with his long-time friend, the Dalai Lama, in Prague. 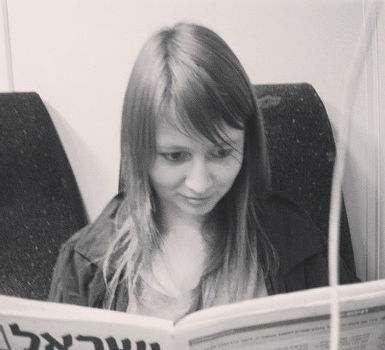 Following Havel's death, three days of national mourning were declared in the Czech Republic. Good bye great man.The world will miss you. Say hello to Frank for us, Mr. Havel. I'm sure he's waiting for you. Between 1992 & 1995 I worked in Prague as an architect. One evening I walked thru the old town and found a pub to have a beer. The place was totally crowded and I saw a table right of the entry with some seasoned gentlemen and I said: "dobrý večer" and one of them raised his voice and said: "Where are you from?" I said Düsseldorf,Germany and he said: "You speak our language?" I said no, not really, but I try to. And all of a sudden those 10, 12 men raised that heavy table up and invited me to join them. They all were Mr. Vaclav Havel's buddies, his intellectual discussion group. I never will forget our conversations that night and I have to say that it hit me hard when I heard that news about Vaclav Havel today. He was a great European. 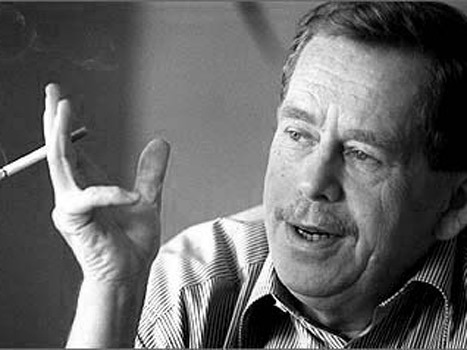 Václav Havel died today after long illness. I'm studying vaclav havel's speech a 'contaminated moral environment' at school, and I think that the best political move any country has ever made was done by Czechoslovakia when they made Havel president. He is an amazing man, we need more people who are more focused on people's best interests and less in business, when it comes to politics! He has done so much for his country, we need more people like him in this world today. Hi!i am a costarrican artist now studying in Prague,HAMU,i have been living in prague 2 years now.little by little i have been discovering mr havels life,works and labour in the fight for the democracy of this beautiful country,wich so much deserves it.i never expected to be so moved by his words and deeds and my appreciation grows more and more everyday as i know him.i come from a country democratic by nature and i grew taking it for granted but now in czech i know what it has been going through!!! thank you dear mr havel for you are one of the greatest men ever! God bless you!